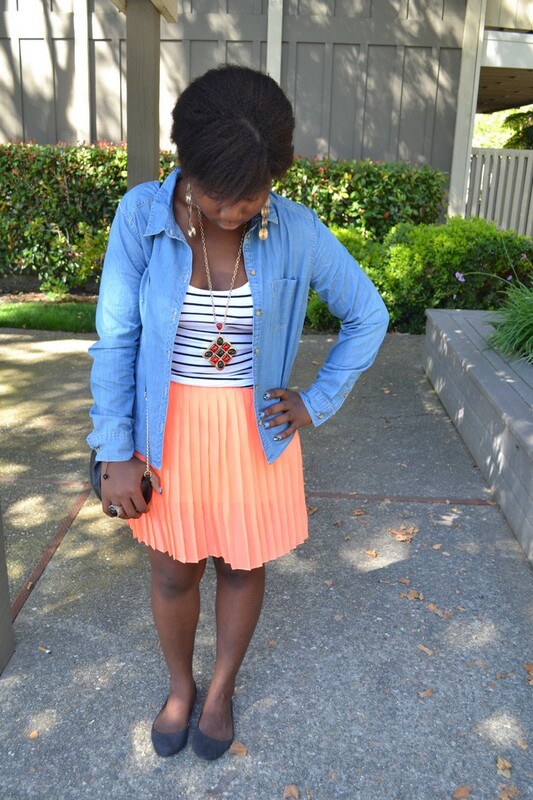 Back to my outfit, I love the denim shirt, I was so glad I could finally have a second one, I paired it with a striped shirt and to add the color pop I wore the neon skirt! Retour à ma tenue, j'adore la chemise en jean, j'étais tellement contente d'avoir enfin pu en avoir un second, je l'ai porté avec une chemise rayée et pour ajouter la touche pop, j'ai porté la jupe néon! your skirts is soooo pretty! I love the color, I ordered a very similar one from f21 but in yellow :) i cant wait to get it! hey i love your blog and your style! i now follow you via bloglovin,on lookbook and with GFC! Love that skirt! The colour is beautfiul. Ta jupe est magnifique! bon courage pour la rentrée!! Diane! 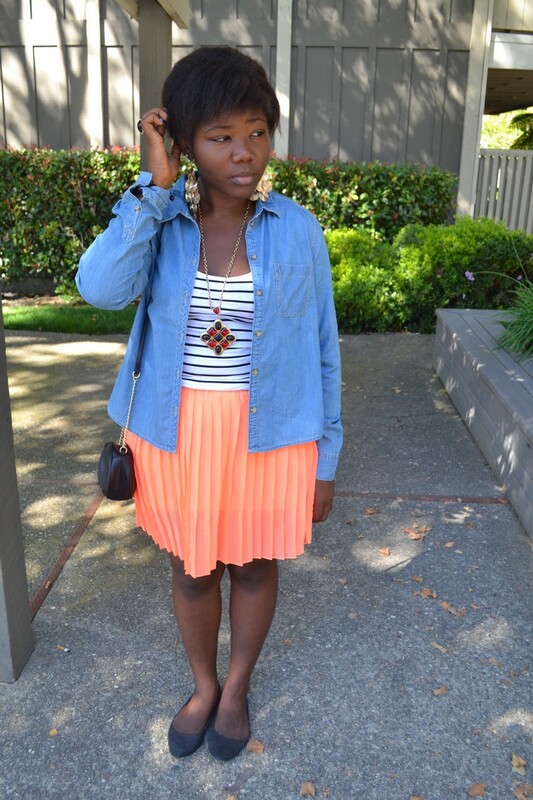 your style is always over the top, you are one of the most amazing bloggers ever. 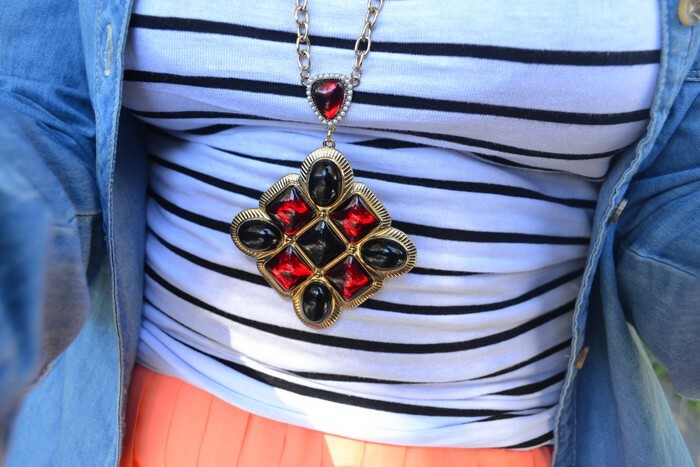 I really admire the way you mix and match different colors and patterns! they suit you so good !! Looking great as always sweet girl !!! 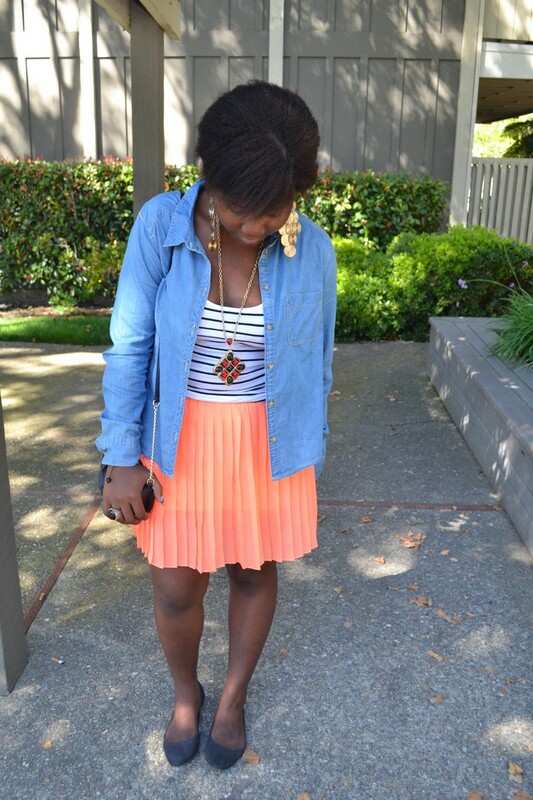 IN LOVE with the melon pleated skirt!! Awesome Outfit. Love the Skirt! 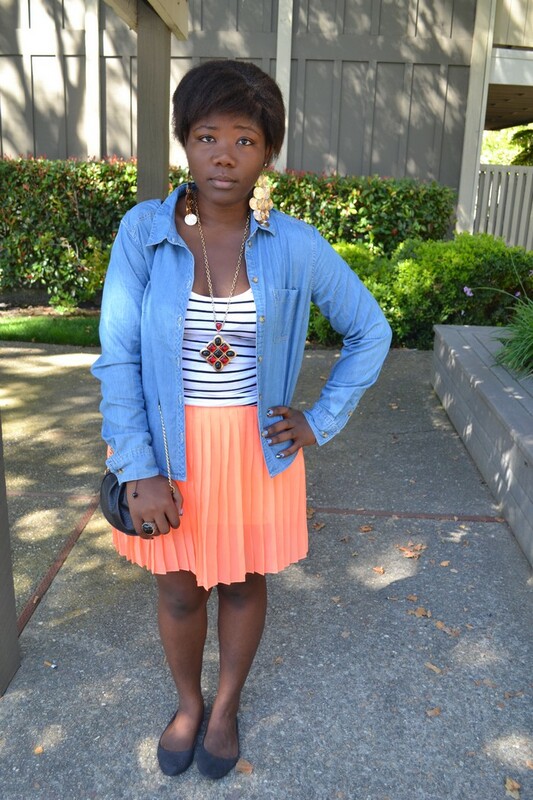 what a lovely outfit :) i love how you combined all the different materials and colours with each other, dear! deeviiiii, tu es adorable dans ces couleurs je te jure. tu sais que j'ai la meme jupe que toi?lol. je te jure la meme. tres belle tenue, franchement j'aime trop. cool skirt, i have many of them... but i like the color that you're wearing! 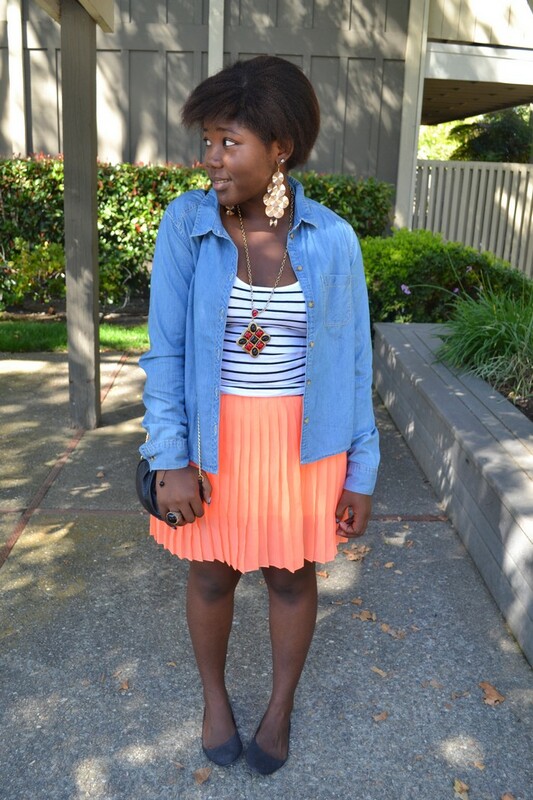 The neon pleated skirt is so pretty and the jewelry is so gorgeous, diane! You look adorable!! Love that skirt!! Oh I love the pleated skirt. Nice necklace! 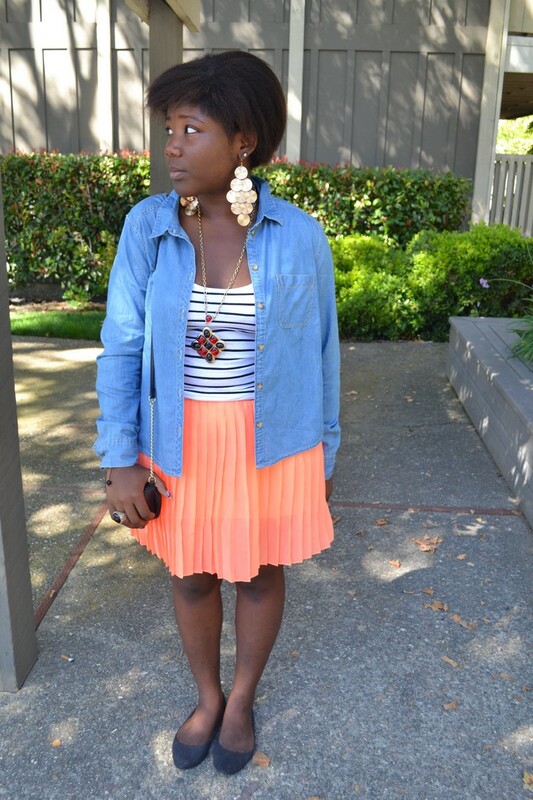 I love the pleated skirt and denim shirt! Just lovely!